(Nanowerk News) Airplanes zoom overhead, wispy-white contrails streaming behind them. The Federal Aviation Administration (FAA) handled 43,684 flights, on average, every day last year, and U.S. military and commercial flights together used over 20 billion gallons of jet fuel. All those emissions add up. World air travel contributed 815 million tons of CO2 emissions in 2016 -- two percent of the global manmade total, according to the International Air Transport Association. And global air traffic is not slowing down. IATA predicts that 7.2 billion passengers will travel by air in 2035, nearly doubling the 3.8 billion that flew in 2016. So how do we make air travel easier on the environment? University of Delaware researchers are working to develop an alternative jet fuel. Instead of petroleum, UD researchers want to power planes with corncobs and wood chips -- stuff you generally don't care much about unless you're a groundhog or a beaver looking for leftovers. In UD's Harker Interdisciplinary Science and Engineering Laboratory, researchers are transforming such plant material, known scientifically as lignocellulosic biomass, into green products, including new fuels and chemicals. 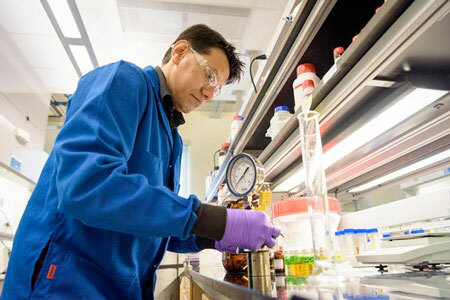 The scientists are affiliated with the Catalysis Center for Energy Innovation (CCEI), an Energy Frontier Research Center supported by the U.S. Department of Energy. Based at UD, the center brings together scientists from nine institutions to work on clean energy challenges. One of the biggest hurdles to making renewable jet fuel, according to CCEI Associate Director Basudeb Saha, is increasing the speed and efficiency of two critical chemical processes -- coupling and deoxygenation. Since the plant material the center works with has a low carbon content once it's broken down from a solid into a liquid, the carbon molecules must be chemically stitched together or "coupled" to create high-carbon molecules in the jet fuel range. Then the oxygen must be removed from these molecules to form branched hydrocarbons. This branching is essential to improving the flow of fuel at the freezing temperatures of commercial flight. "International planes may fly at an altitude of 35,000 feet, where the outside temperature could be as low as -14° Centigrade," says Saha, who is leading a renewable jet fuel project at the center. "That's the temperature at which a plane has to run, and the fuel can't be frozen." The demand persists for non-petroleum-based fuel for aviation. More than a decade ago, the FAA had set a target of using 1 billion gallons of renewable jet fuel by 2018. According to IATA, sustainable aviation fuels are integral to its pursuit of carbon neutral growth from 2020 on, and to a 50 percent reduction in net carbon emissions by 2050 (relative to 2005 levels). But not enough quantities of this alternative fuel are being produced, nor at a competitive cost. Currently, several U.S. companies make renewable jet fuel from materials such as triglycerides extracted from used oil and grease, or from a combination of carbon monoxide and hydrogen called syngas. One company uses algae as its source material and even has an underground pipeline to the Los Angeles Airport (LAX), where a percentage gets mixed with conventional jet fuel, Saha says. However, processing this non-conventional material requires high temperatures--350°C (662°F)--and high pressure as well. Not so with those wood chips and corn cobs at UD, where Saha and his colleagues have developed new catalysts -- so called "chemical goats" -- that kickstart the chemical reactions that can transform this plant material into fuel. One of these catalysts, made from inexpensive graphene, looks like a honeycomb of carbon molecules. Its unique surface properties increase the speed of the coupling reaction. It also operates at low temperature (60°C). Another catalyst removes oxygen in an energy-efficient way and produces high yields of branched molecules, up to 99 percent, suitable for jet fuel. Both catalysts are recyclable, and the processes are scalable. "The low temperature and high selectivity of our process can enable cost-competitive and sustainable production of bio-based aviation fuels from lignocellulosic biomass," Saha says. The research is detailed in three recent scientific articles: "Solventless C-C Coupling of Low Carbon Furanics to High Carbon Fuel Precursors Using an Improved Graphene Oxide Carbocatalyst" and "Hydrodeoxygenation of Furylmethane Oxygenates to Jet and Diesel Range Fuels: Probing the Reaction Network with Supported Palladium Catalyst and Hafnium Triflate Promoter" both appeared in ACS Catalysis, which is published by the American Chemical Society, and "Catalytic Hydrodeoxygenation of High Carbon Furylmethanes to Renewable Jet-Fuel Ranged Alkanes Over a Rhenium-Modified Iridium Catalyst" was featured in ChemSusChem.